With its Tough series, Olympus is no stranger to rugged point-and-shoots, but the 4K-capable Tough TG-Tracker is the first true action camera from the company. 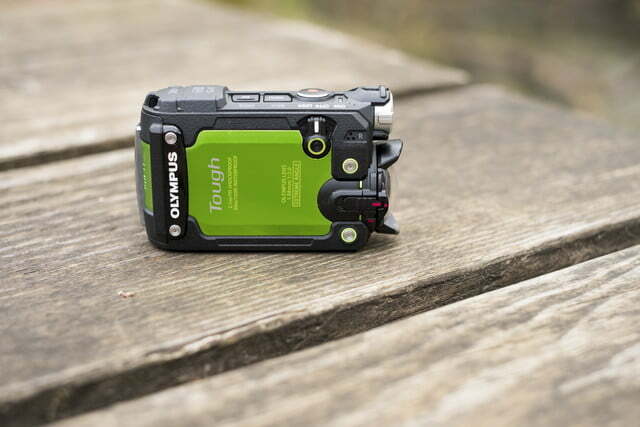 Just from looking at it, it’s easy to see that Olympus has taken a different approach from GoPro, Sony, Garmin, and other action cam makers, with a design that represents a miniature camcorder, complete with a flip-out screen. On the inside, the camera’s features include a healthy does of competitive tech, going beyond simple video capabilities with a host of sensors like a GPS, compass, accelerometer, thermometer, and barometer. The TG-Tracker is also waterproof down to an impressive 100 feet without the need for an extra case. 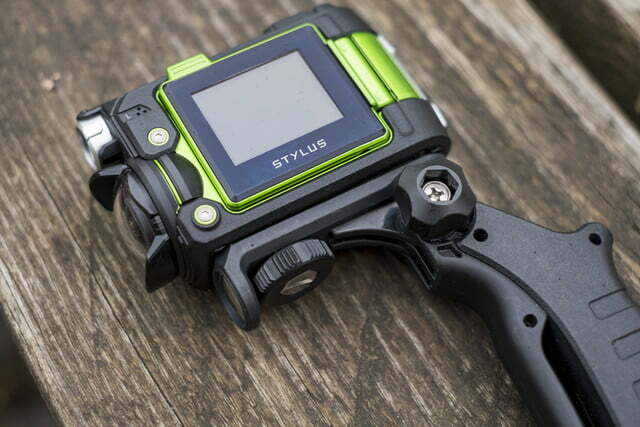 A standard tripod thread is the sole attachment point, but a GoPro mount adapter comes with the camera, opening up a whole world of mounting options. 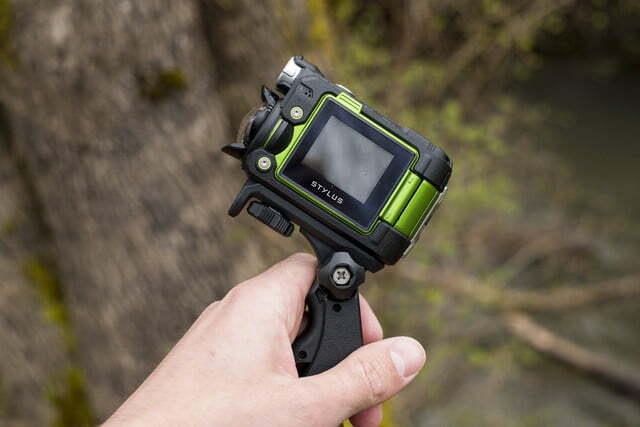 While it is certainly built to handle the needs of the action sports crowd, it is perhaps even better suited for the more casual outdoor adventurer, thanks to its intuitive controls and focus on handheld operation. A pistol grip-style handle is even included in the box (called the Steady Grip) that further improves ergonomics. With specifications that more-or-less match up with competitors, it is the TG-Tracker’s design that differentiates it. The large, f/2 lens dominates the front face of the camera, with a small LED video light directly above it. A plastic protective cover bayonet-mounts into place over the lens (an underwater lens protector with a flat surface is also included in the box). Opening a two-stage locking door on the back of the camera reveals the battery, MicroSD card slot, and USB and HDMI ports. The battery is interchangeable and the camera can also be charged over USB. 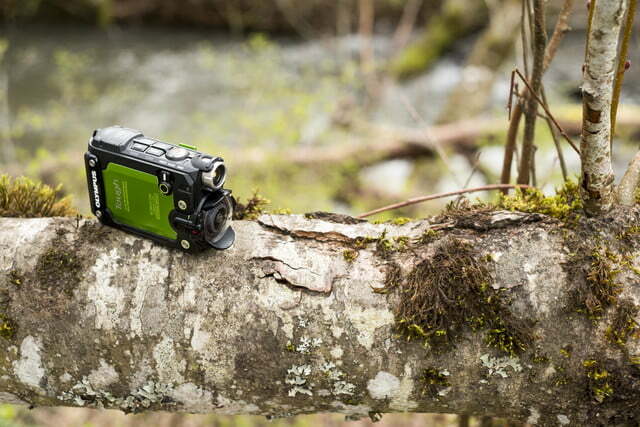 At 3.67 inches long and weighing 6.35 ounces, it’s not the smallest or lightest action cam, which may make it more difficult to mount in certain spaces. 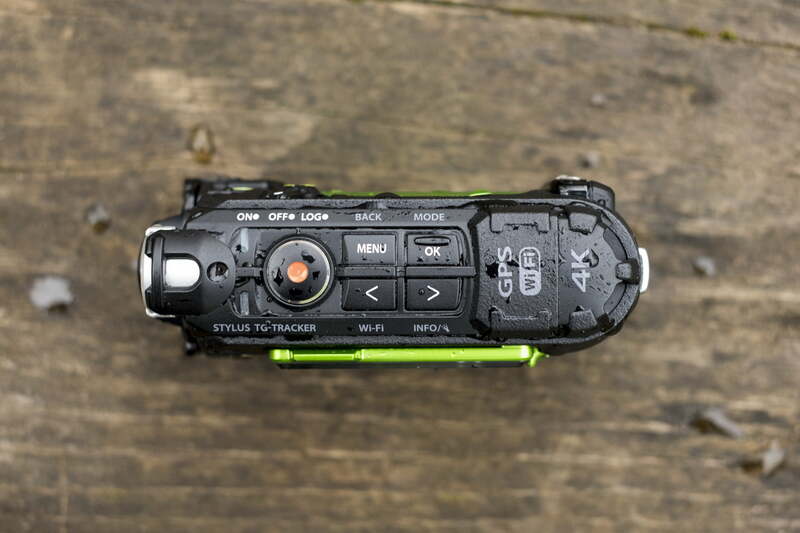 The Tracker makes good use of its extra area, however, by offering a physical power switch, five clearly labeled control buttons (including a large, dedicated record start/stop button), and a 1.5-inch flip-out screen. 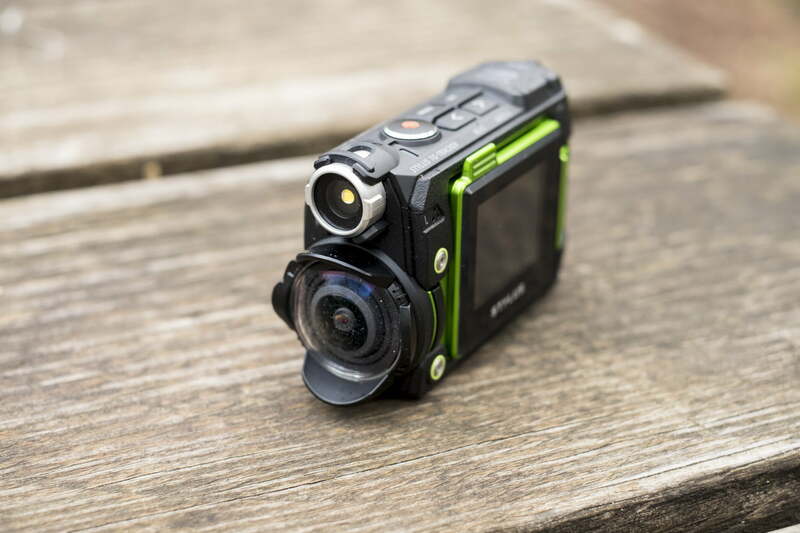 We tested the bright green version of the camera, but it’s also available in black if you’d rather have one that is more discreet, but potentially easier to lose. Combined, the control layout and flip-out screen provide a very user-friendly experience. 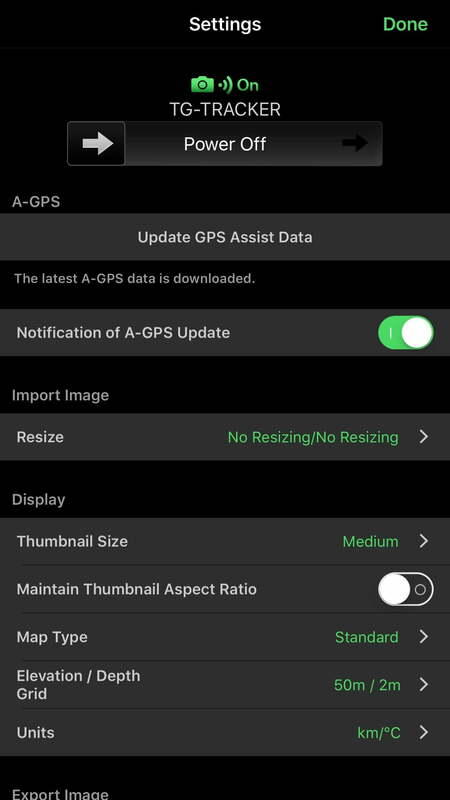 Navigating the menu and setting preferences is simple, and it’s nice that the buttons are labeled with all of their functions. 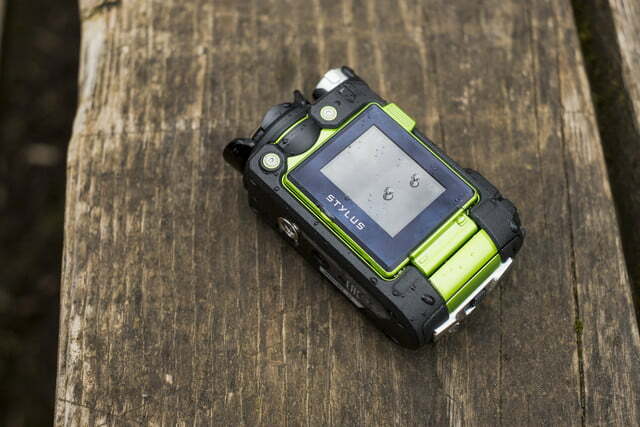 The TG-Tracker is waterproof down to an impressive 100 feet without the need for an extra case. 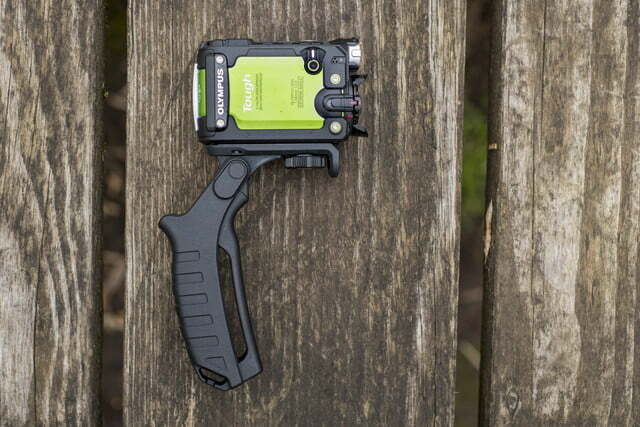 Most action cameras are “set it and forget it” devices, but the TG-Tracker works well for those times when you want to be able to easily start and stop recording at a moment’s notice. We were impressed with how quickly the camera powered up. 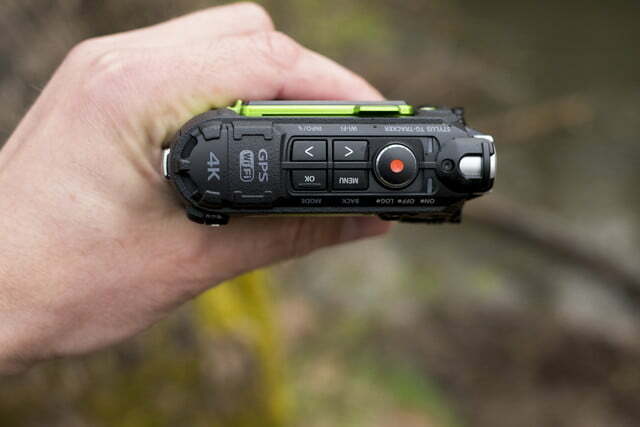 It’s possible to go from off to recording in less than a second, a feat further streamlined by turning on Quick Capture mode which automatically begins recording when the power switch is set to “on.”Beyond personal use, we could see the TG-Tracker being perfect for science class field trips thanks to its easy-to-use design and assortment of data-gathering capabilities. 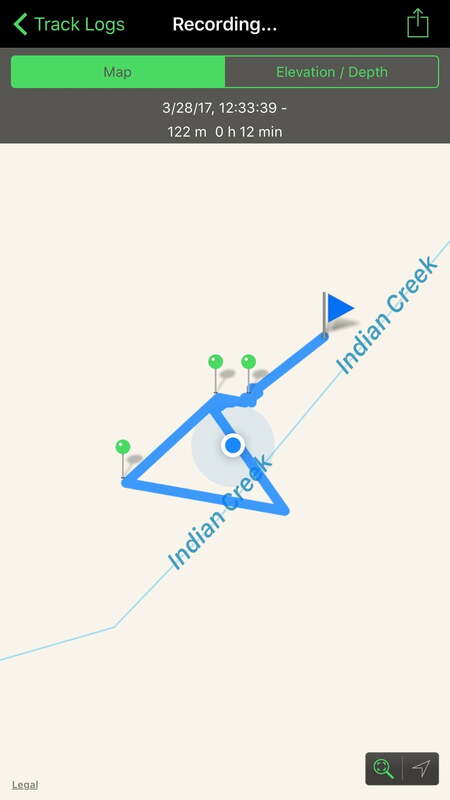 It would seem that having one tool that can measure temperature, pressure, and location – and document the trip at the same time – could definitely come in handy in an education environment. As for the imaging capabilities, the TG-Tracker pairs an eight-megapixel sensor with an ultra-wide, 204-degree lens. That means it has just enough pixels to capture 4K video, yet won’t match the 12MP still photos offered by the GoPro Hero5 Black. But the lens is considerably wider than that of the GoPro, which has a maximum angle of view of roughly 150 degrees. While marketing departments typically advertise wider as better, 204 degrees is, in many cases, simply too many degrees. Yes, it lets you capture a broad swath of the landscape in front of you, but it comes at the expense of extreme distortion and significant image softening in the periphery. While a narrower field of view is possible using the underwater mode (which crops the image in order to avoid vignetting when using the underwater lens protector), there simply aren’t enough pixels to do this in 4K mode without sacrificing image quality. We really liked the five-axis electronic image stabilization. Such a wide lens seems especially out of place given the TG-Tracker’s apparent emphasis on handheld use, where users can accurately frame their shots using the LCD and simply pan to reveal more of their surroundings. Undoubtedly, there will be times when that 204-degree viewing angle will be appreciated, but we would prefer to have a sharper, narrower lens. At the very least, it would have been nice if it had been married to a higher-resolution sensor that could have allowed for cropping in 4K mode. The video specifications also fall a little behind those of the GoPro Hero5 Black. It shoots 4K at 30 frames per second (fps), which is par for the course, but 1080p is capped at 60 fps, versus 120 fps for the Hero5. The Olympus does offer frame rates up to 240 fps, but the resolution has to be dropped to 720p in order to achieve them. Another thing that negatively impacts image quality, but isn’t necessarily unique to the TG-Tracker, is water, fog, and dust buildup on the lens. This may be a no-brainer, but make sure you bring a lens cloth with you as keeping the lens protector clear will help you get better results. While the image quality itself may leave something to be desired, we really liked the five-axis electronic image stabilization (EIS). Unlike on the GoPro Hero5 and Garmin Virb Ultra 30, the TG-Tracker’s EIS can even be turned on in 4K mode, and it works quite well. Yes, this results in some cropping and loss of sharpness, but it is a nice option to have. With data logging enabled, the TG-Tracker continually records and saves GPS and sensor data when the camera is turned on or put in “log” mode. This information can be accessed through the Olympus Image Track (OI.Track) app, along with associated video clips and still images. Users can view and transfer both video files and log data within the app, but if you simply want to save videos or photos, you should use the OI.Share app, instead. The OI.Track app organizes all media by its associated log data, so you can only view videos after first selecting a log file. Media will then show up, but only the clips and images associated with that particular log data. This makes it very difficult to find a specific clip or image when you may not know the exact time or date it was made. Fortunately, OI.Share simplifies this process, but of course that app can’t see the log data. Still, the OI.Track app has come a long way since when it was first introduced last year. Initially only offered for Android devices, it is now also available on iOS. Many features once lacking, like telemetry overlays and 4K support, have been added in. There are, however, some limitations with how the app handles 4K video. On Android devices, clips shot in 4K will be automatically downsized to 1080p on import. Newer iOS devices will handle 4K import, but the app will only export up to 1080p. Holdouts still using an iPhone 5C or older won’t be able to import 4K videos at all. 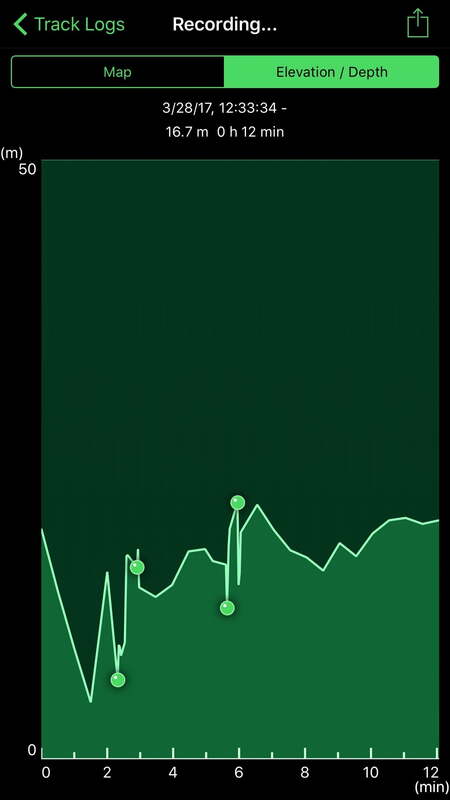 The OI.Track app takes some getting used to and is one of the weak points of the TG-Tracker. 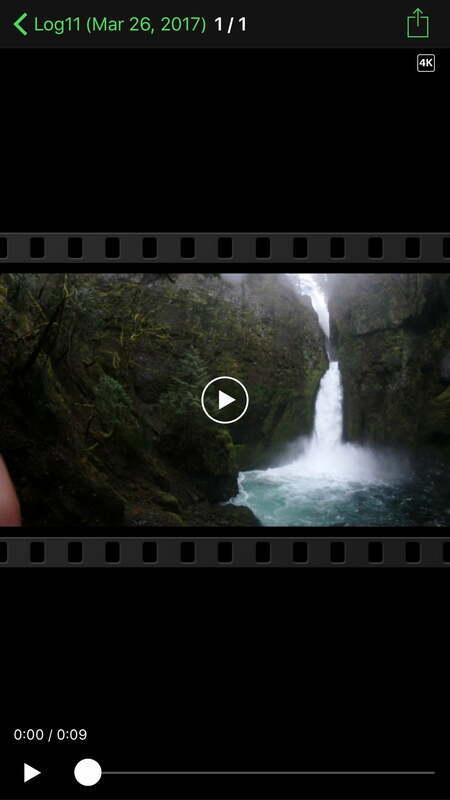 Compared to the streamlined UI and deep features of GoPro’s Capture app, there is plenty of room for improvement. Still, we like what it can do – like, displaying media on top of a map or elevation graph – even if we don’t particularly care for how it does it. 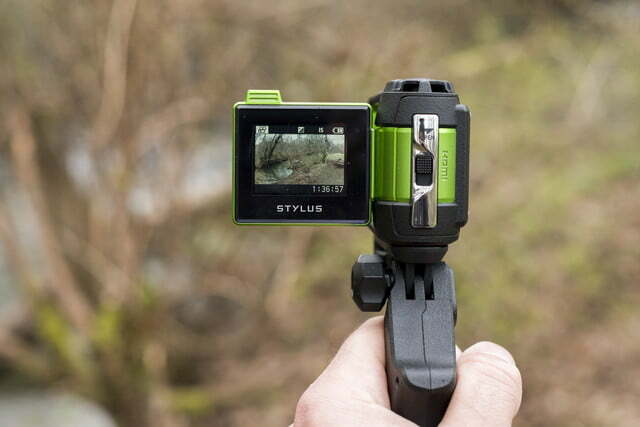 As a first-generation product, the TG-Tracker shows that Olympus can produce a unique action camera that stands out from the crowd in a very saturated market. 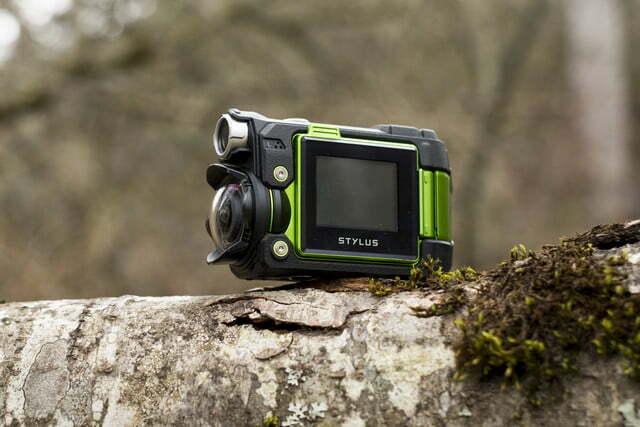 Rather than directly copy competitors, it tried to do something new by putting typical action camera features in a friendlier, camcorder-like body. It’s a formula that has mostly paid off, but it’s far from perfect. We love the flip-out screen, but it doesn’t tilt up or down. It may have been too difficult or costly to engineer more articulation without compromising the strength of the camera, but we hope Olympus can figure this out for the next version. Not being able to tilt the screen was a small but constant source of frustration. The video light is another novel but imperfect feature. At just 60 lumens, it isn’t really bright enough to be as helpful as we would have liked. (To put this in rough perspective, a small LED flashlight puts out around 180 lumens and a typical 60-watt incandescent bulb will put out at least 800 lumens). We took the camera into a small snow cave on a cloudy day, and the added illumination from the TG-Tracker’s LED barely overcame the meager amount of natural light that was leaking into the cave. Still, it’s hard to fault Olympus for including features that are merely imperfect, when competing models lack them entirely. Finally, we appreciate the layout of the camera, but there are some functions that are confusingly buried within the menu. For example, there’s no easy to way to snap a still picture – you have to manually switch to photo mode within the menu first. Then again, with stills not offering any more resolution than video, you may be better off just shooting a quick video clip and extracting a still frame later. We also would have liked a physical switch or button to control the video light, as it also requires a dive into the menu to turn on. 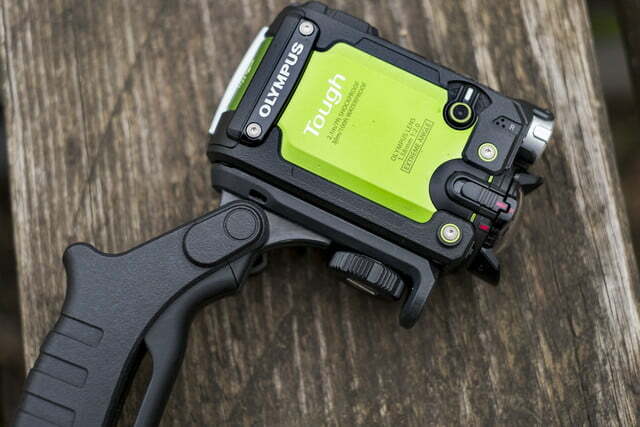 Olympus offers a one-year limited warranty. The Tough TG-Tracker stands out from the crowd thanks to its design, control layout, and sensors. 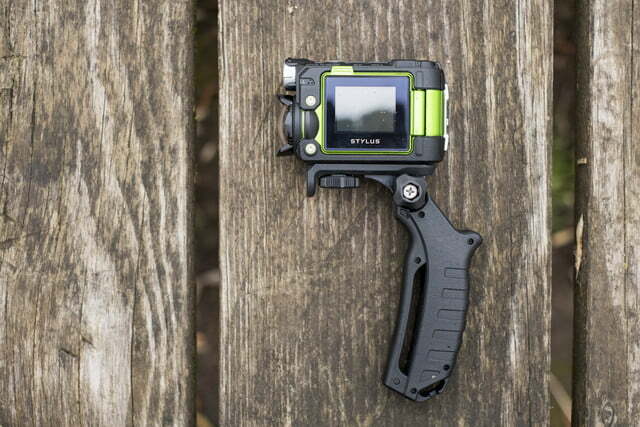 It is a versatile little camera that reaches beyond the typical action camera use cases by focusing on handheld operation. Image quality could be better and the lens is simply too wide for most scenarios, but we still enjoyed our time with it. It is a good hiking companion even in bad weather. For extreme sports enthusiasts, the newer but more expensive GoPro Hero5 Black is still the way to go. 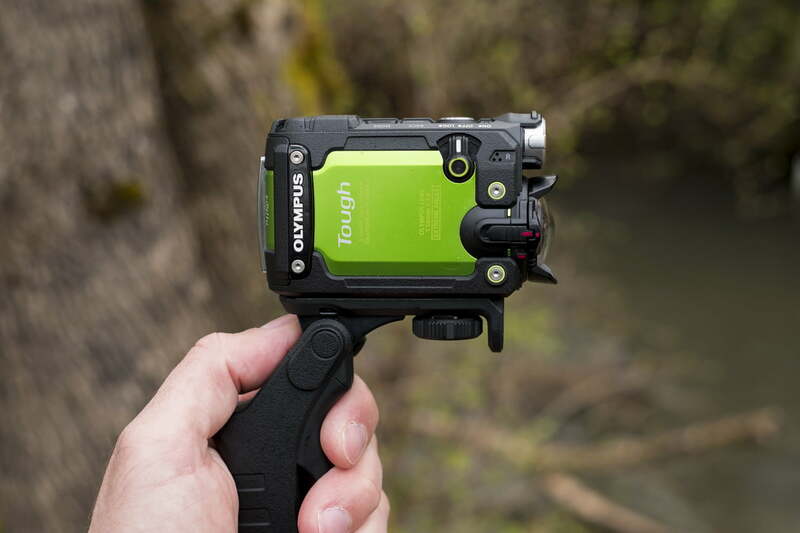 The Tough TG-Tracker, while usable as a mounted camera, seems more geared toward hiking and backpacking. 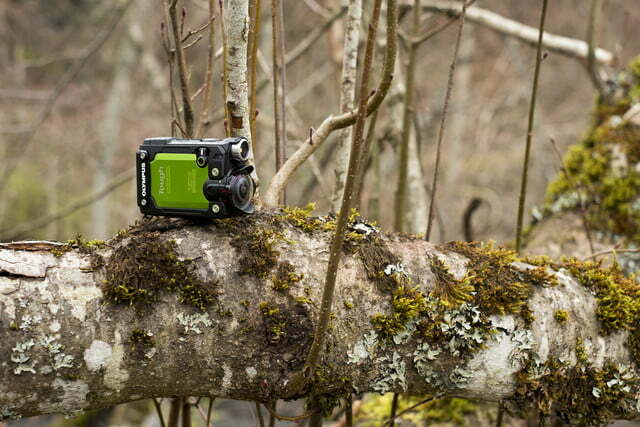 For these uses, we can’t really imagine a better action camera. 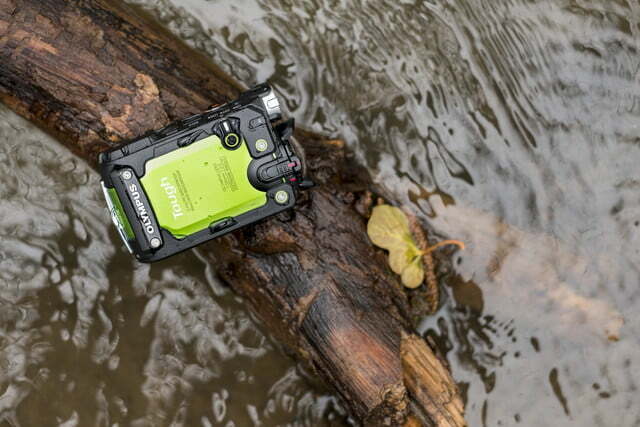 It provides a great way to document your adventure, and you won’t have to worry about dropping it, submerging it, or taking it out in the rain or snow. 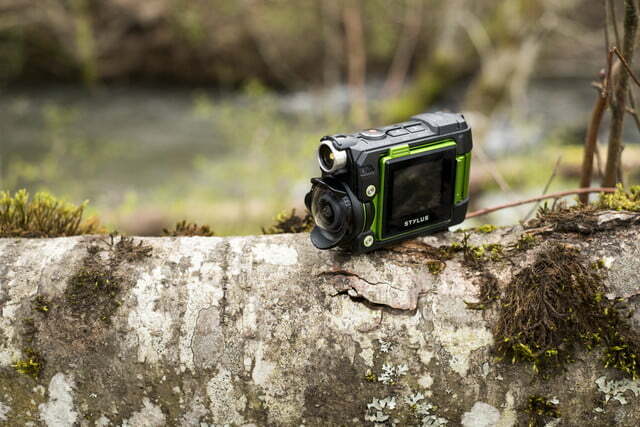 The camera is obviously built to endure a rough and tumble lifestyle, so we expect it will last a while. The plastic lens cover may get scratched over time, but this is easily replaceable. 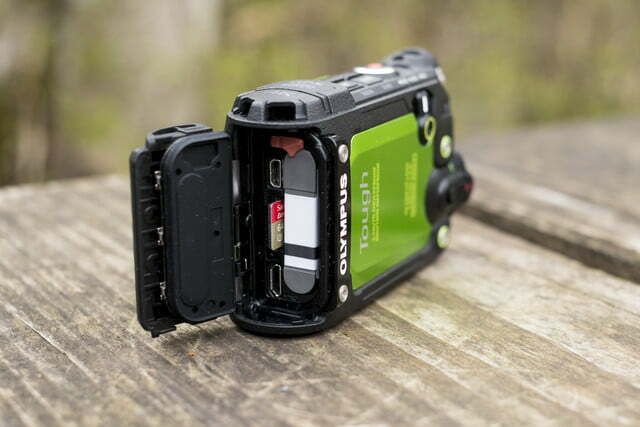 Compared to other action cams, the TG-Tracker’s flip-out screen may be subject to increase risk of impact damage, but it does not feel particularly fragile. 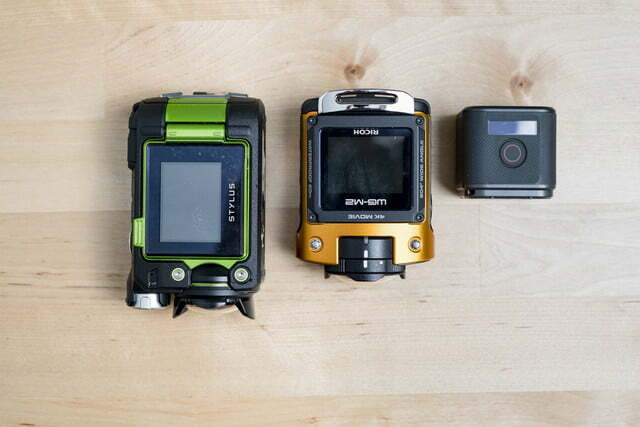 As with all action cameras, there’s always the risk of a newer model coming out that will offer more features at the same price. However, at just $300 after an instant rebate available at the time of writing, the TG-Tracker stands as a very good value today. If you enjoy outdoor activities and want an easy-to-use camera that offers more features and durability than your phone, then yes. If you’re looking for the best image quality or want an action camera expressly for mounted, hands-free use, then the TG-Tracker probably isn’t the best option for you.